How’s your breakfast looking these days? Ho hum? Boring? Let’s work on that! 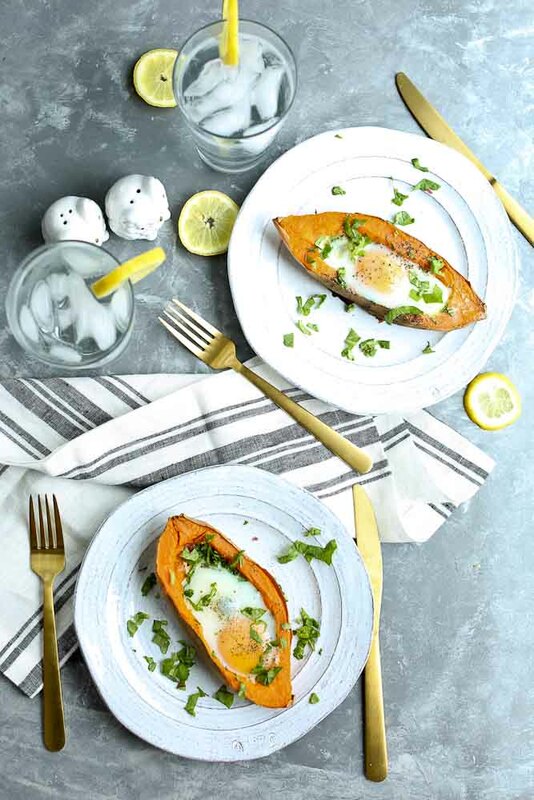 This recipe for baked eggs with spinach in these awesome sweet potato BOATS is going to elevate your breakfast game 100%. That’s how you can sell this to your kids. 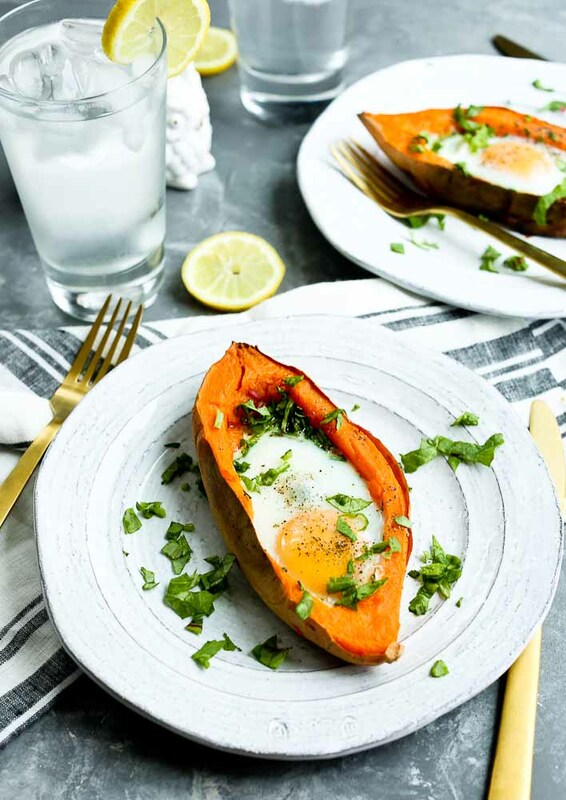 Who doesn’t want to eat breakfast in a sweet potato BOAT? Pretty cool if you ask me. Another thing I love about this recipe is I can make a batch and then have breakfast ready for days. Meal prepping for the win. The yolks get a little more cooked when I reheat, but I still love ’em. Eggs+spinach+sweet potato is just such a great combination. Yes, it’s super healthy. But really, it’s all about the flavor!! I can’t get enough of this and have been eating it for two weeks straight. Let me show you how the prep goes down. The only part that takes a while is initially cooking the sweet potato. BUT. You can easily cut that down by using your microwave. No judgement here. 😉 Ours just happens to be broken at the moment and we’re kind of getting used to living without it. So let’s check out this (easy!) process! First you need to cook your sweet potatoes. It’ll take about 10 minutes in the microwave, or an hour in the oven. Then you want cut them in half and scoop out the flesh, leaving a small rim of flesh around the edges and a little bit in the bottom. You want to leave room for the spinach and egg to bake inside. 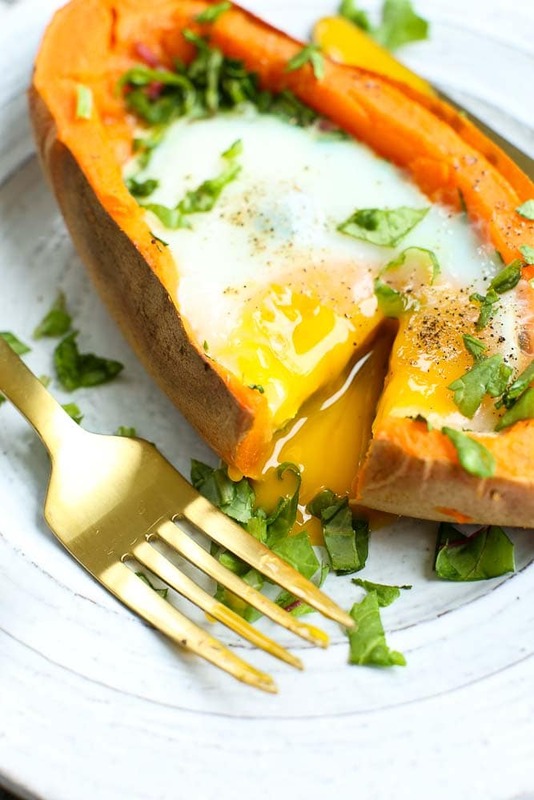 Then you carefully crack one egg inside of each sweet potato half. These go into the oven and are ready in about 15 minutes. You can bake them longer if you want the yolk cooked through, but I’m all about the runny egg! Although I’ve been making these for myself nonstop, I think they’d also be perfect for when you have weekend company. What a fun and unique breakfast to serve to your guests! I hope you all love these as much as I have. 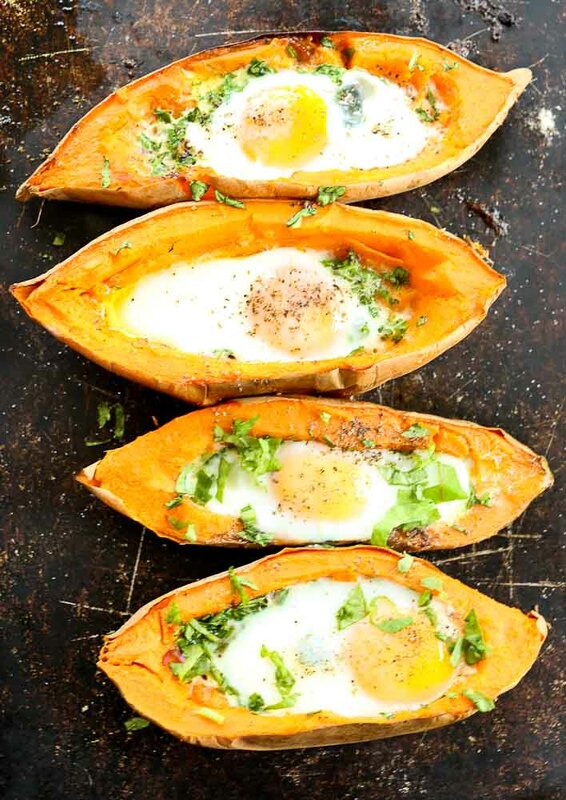 Bake your eggs right in sweet potato “boats” in this nutrient-packed breakfast! 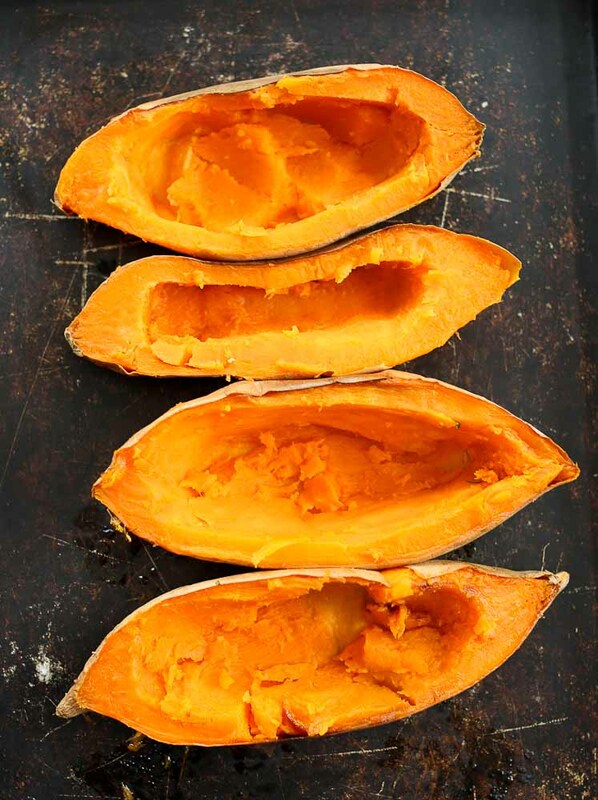 Slice the cooked sweet potatoes in half and scoop out most of the flesh, leaving a small rim of flesh around the skin. (see photos) Reserve the flesh for another use. Season the sweet potatoes with salt and pepper. Add the small cubes of butter to each half and then top with the chopped spinach. Season with salt and pepper again. 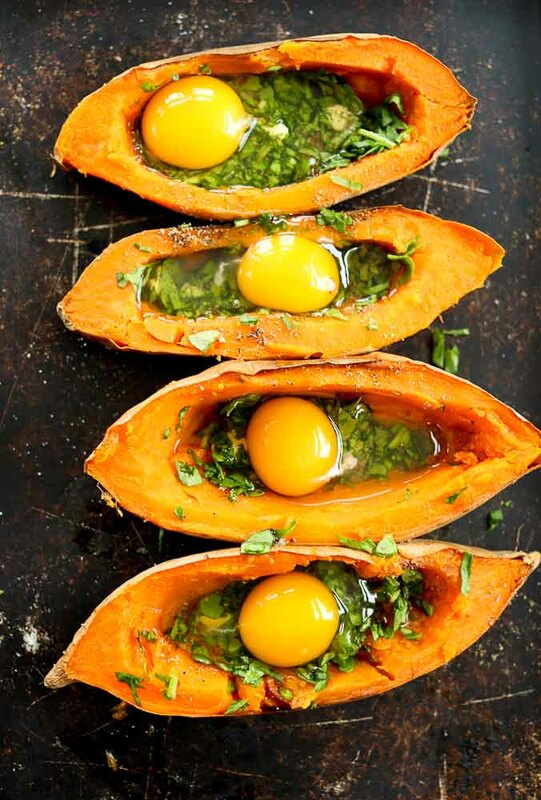 Carefully break one egg into each sweet potato half. Season one last time with salt and pepper and serve. *Make sure you get large sweet potatoes, or the egg won’t fit inside. When you make these ahead, are you making just the shells ahead or the whole thing, even the egg being baked, and then refrigerating? I do the whole thing, but you could definitely just make the shell and prepare it all except the egg. It’s just a quick reheat when you make the whole thing, but the yolk does get more cooked when reheated. Have you tried reheating these? 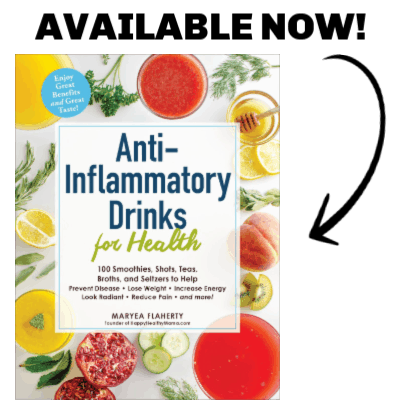 Yes, I have, and it works well! Every time I make them, in fact, I reheat one each day after that. The yolk does get more cooked than I would prefer when I reheat, but otherwise no issues. 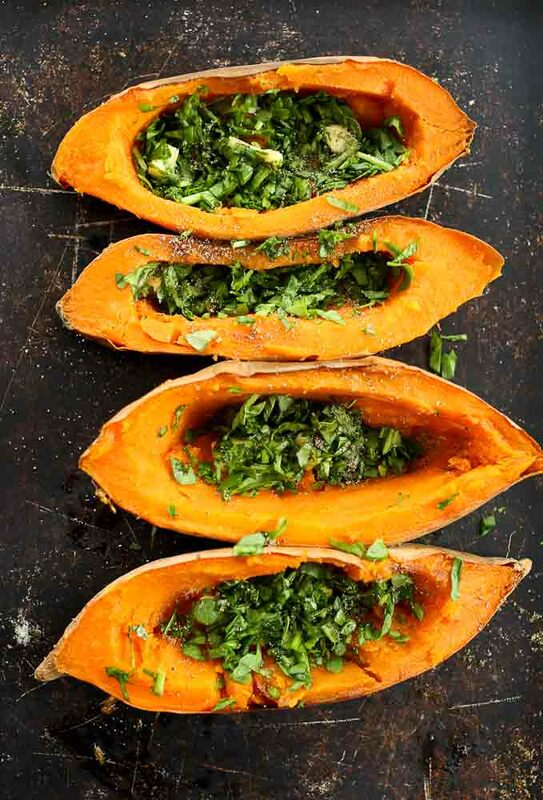 Have you tried cooking sweet potatoes in instantpot before microwave/oven? If so, how long and what setting? Delicious! I used kale because I already had it. Will definitely make these again! Thanks for the feedback, Coby!